Overall Miami Dolphins, St. Louis Rams & Cincinnati Bengals' offenses are looking better for 2013. Rams defense also looking improved. E.J. Manuel played quite nicely as he started for the Bills in preseason game one. Looks like could be his job to lose as we wait for Kevin Kolb to return after suffering a slight injury slipping on a mat. Manuel could make a reputable backup quarterback later on during the fantasy season. Tyler Wilson giving Terrelle Pryor a challenge for No. 2 Raiders' QB job. Matt Flynn is currently listed as the Quarterback No. 1 for the Raiders. Both Michael Vick and Nick Foles played well in preseason game one. Vick had the start. Look for Foles to start preseason week two. Jags' Chad Henne and Blaine Gabbert quarterback competition shows Gabbert getting the start unless outplayed during preseason. Cam Newton starting to rank higher in preseason rankings, not drafted until mid-rounds in mocks. Slight sleeper value here. Jason Campbell showing up Brandon Weeden in OTA's. Tony Romo and Peyton Manning - Easy Schedules, Romo's starts getting tougher week 14. But could always swap in a new QB towards end and for fantasy playoffs. Sam Bradford armed with new WR's, (Tavon Austin). NFC South QB's Brees, Ryan, Newton and Freeman now have to face Darrelle Revis. Geno Smith/Mark Sanchez we will have to watch who ends up with start. I view both as a bye-week fill in at best. Currently competing for starting job. Ryan Tannehill - has a group of great receivers and he comments that Mike Wallace is the fastest receiver he's ever seen. RGIII - keep an eye on his healing. Would draft a stronger quarterback at this point and save RGIII as a backup. Backup quarterback Kirk Cousins is a great handcuff to RGIII. Keep an eye on Jamaal Charles' foot injury. It's questionable that he'll play preseason week two. Ahmad Bradshaw now with the Colts. Will have to see if Vick Ballard takes a back seat. Bradshaw prone to injuries. Reggie Bush - look for him to draft a little higher in PPR leagues. Bush may be used occasionally for punt returns. Matt Forte to be more involved in receptions - PPR value here. Lamar Miller w/ Dolphins hot now with Reggie Bush out of the way. David Wilson appears to have the starting role which is more evident after Andre Brown fumbled early during the preseason one game. Depth Charts show Ronnie Hillman as the starter. Rookie Montee Ball should play a significant role however may get the start. Knowshon Moreno is still a factor too. Eddie Lacy or Johnathan Franklin new to the Packers. Franklin may be the man. 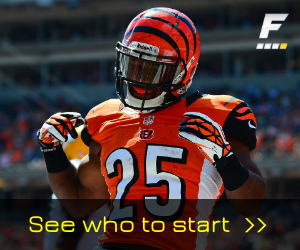 Giovani Bernard, new to Bengals - might hurt Law Firm's value if he continues to excel. Looked good preseason game one. Joseph Randle, new to Dallas - nice compliment to Demarco Murray, who is prone to injuries. Running backs Philip Tanner and Lance Dunbar also competing for Murray's backup. Looked good in Hall of Fame game on 8/4/13. 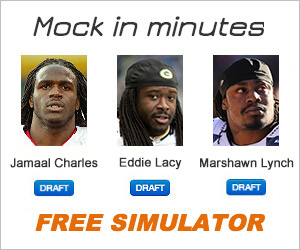 Keep an eye on rookie Zac Stacy of the Rams. His skills preliminarily mirror those of Alfred Morris. Chargers' Danario Alexander it out for the whole season after suffering a torn right ACL. Look for Vincent Brown to step in for the sleeper pick. Malcom Floyd just injured his knee 8/12/13, waiting for outcome on severity of the injury. This definitely impacts Philip Rivers' fantasy value. Packers' Jordy Nelson out for preseason after having knee surgery. He should hopefully return for the regular season. Draft the injury-prone Nelson with caution. Eagles' Jeremy Maclin out for full season with torn ACL. Danny Amendola now with Pats, good fantasy potential replacing Welker. Speaking of Wes Welker, the Broncos receiving corps just became more crowded putting a damper on the points we saw last year from D. Thomas and E. Decker. Randall Cobb, and hopefully injury prone Jordy Nelson should see more action w/ Greg Jennings out of the way. Randall Cobb was a PPR machine last year. Tavon Austin should have a large role with Sam Bradford and the Rams. DeAndre Hopkins, new to Texans and a nice opposite for Andre Johnson. Percy Harvin now w/ the Seahawks now recovering from hip surgery. May not return until late November. Draft with caution. PPR upside if he returns healthy. Larry Fitzgerald will hopefully come back to fantasy relevance with an improvement at QB, Carson Palmer flying with the Cardinals. Mike Wallace and Brian Hartline for Miami Dolphins present a dual pack of receiving power this year with a hopefully improved Ryan Tannehill. TY Hilton of the Colts - Sleeper alert. He will be competing for 2nd WR spot against Darrius Heyward-Bay, who recently suffered a knee injury the last week of July. Michael Crabtree, 49ers might be out all season. Look for Anquan Boldin and Ricardo Lockette (sleeper) and A.J. Jenkins to pick up the slack. Keep an eye on Patriots' Tight End, Jake Ballard. Pats are hurting at that position (see next items). Rob Gronkowski value slipping in mock drafts due to surgeries, recovery time, overall endurance to last through a season..
Vernon Davis was clicking with Kaepernick towards end of 2012. WR Crabtree is out for long term, 49ers to rely more on TE's. Jordan Cameron with the Browns - potential fantasy sleeper. Dustin Keller now at the hands of Tannehill - Could we possibly see more than 1 or 2 fantasy points per week from him this year? Zach Miller of the Seahawks - Russell Wilson targeted him more during playoffs last year. Sleeper - Brandon Myers now with New York Giants. Had some good catches last year with the Raiders. Ravens' Dennis Pitta is out for the season due to hip injury/surgery. Ed Dickson to fill in, however, he'll be out for a couple weeks of preseason with a slight hamstring injury. Ravens also signed tight end Dallas Clark to help pick up the load. 6 Responses to "Notes: Sleepers, Watch, Strategies"
if I killed a spider it would rain. I still protect spiders and carry them safely out of the house. (I still won’t touch them, though). Remember the step on the crack break your mother’s back – I was sure worried about that one for a few months. Hahahaha! I enjoy Adam L’s blog very much – but the posters there pretty much spew venom at Don Nelson at every opportunity – which made me look at Felt’s blog, which I now enjoy just as much! I wanted to write down a brief remark to say thanks to you for those marvelous tips you are placing at this site. My extensive internet look up has finally been rewarded with good facts to go over with my visitors. I ‘d point out that most of us website visitors actually are rather blessed to exist in a fabulous network with so many lovely individuals with very helpful secrets. I feel rather fortunate to have come across the website and look forward to plenty of more exciting moments reading here. Thanks once more for all the details.